When the Mariners sought public money to build Safeco Field, they said they needed an expensive retractable roof to guard against Seattle’s rainy weather. Now they’re citing the roof as an example of aging infrastructure that must be kept up. When the Mariners sought public money to build Safeco Field, they said they needed an expensive, umbrella-like retractable roof to guard against Seattle’s rainy weather while allowing the team to play on natural grass in the open air. The proposal was controversial, with critics questioning whether the roof was needed, and state lawmakers had to rescue the plan after voters rejected a tax hike. Now, two decades later, another controversy has broken out and the club is again hitting the public up for assistance with Safeco Field’s most distinctive and costly component. 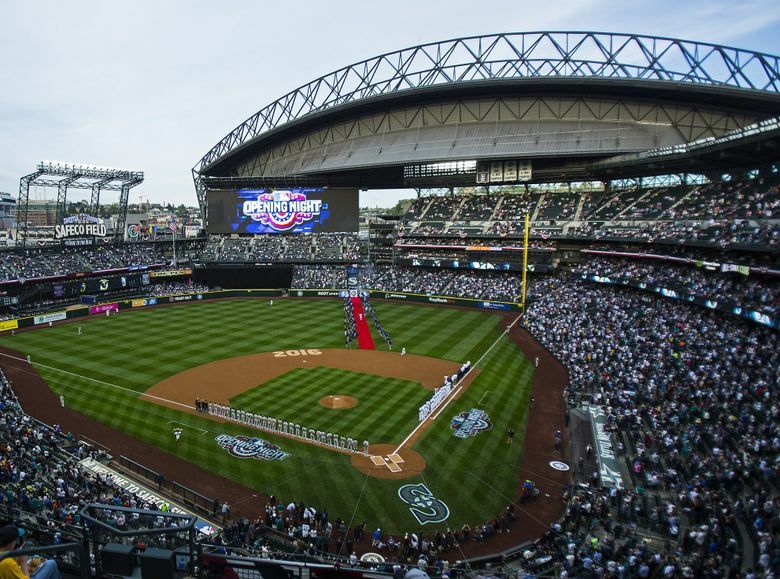 This time, the Mariners are demanding the commitment of an additional $180 million in taxes from King County for capital improvements before signing a new long-term lease at the public-owned ballpark and are citing the roof as aging infrastructure that must be kept up. The hotel-motel tax allocation would be part of a broader $800 million-plus plan to renovate the stadium, with the Mariners also contributing. The team says the allocation could help pay for more than $32 million in roof projects, including new wheels and axles, painting and a new plastic membrane. 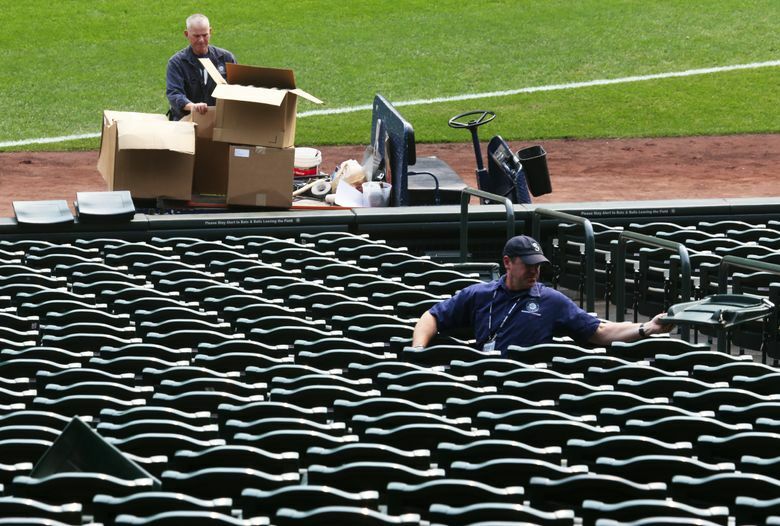 “We want Safeco Field to last a very long time,” spokeswoman Rebecca Hale said. Yet some officials are balking at spending even more public dollars on the ballpark and a roof that the Mariners use more for grass than for games. The county’s hotel-motel taxes would be allocated on top of admissions and parking taxes already set aside for Safeco Field improvements. The Mariners use the roof for games less than they originally predicted, playing under cover fewer than 20 times per season. But the club moves the roof constantly for other purposes, such as non-baseball events and for protecting the grass from the rain and sun, opening or closing it a total of nearly 400 times per year. Trevor Gooby, the team’s vice president for ballpark operations, often confers with Mariners groundskeeper Bob Christofferson about the moves. Though the painting and membrane projects are unrelated to how much the structure has been used, a construction defect has led to greater wear and tear whenever the roof rolls, resulting in prematurely worn bearings and cracked axles. Set to meet Wednesday, the council could allocate what the Mariners want, as proposed by County Executive Dow Constantine and backed by Councilmembers Joe McDermott and Pete von Reichbauer. Or the council could choose to contribute less. Councilmember Jeanne Kohl-Welles withdrew her support for Constantine’s plan last month, suggesting the county instead spend most of the money on affordable housing. The roof was an experiment when Safeco Field was built because the Toronto Blue Jays were the only Major League Baseball team with a retractable roof at the time, and their structure sealed their stadium rather than working like an umbrella. 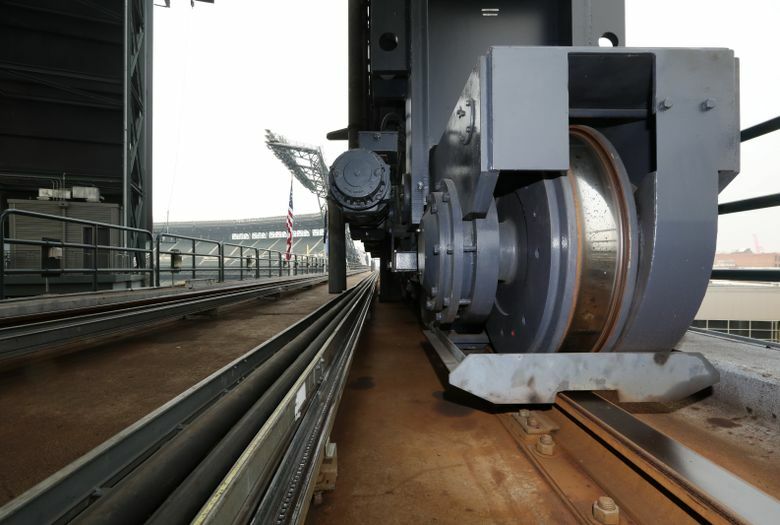 For Seattle, local crane engineer Neil Skogland designed a roof that would move in three sections on giant steel railroad wheels. The system is impressive, sliding an 11,000-ton cover over the ballpark in a matter of minutes at the push of a button, and the roof has done its job, allowing fans to travel from far and wide without having to worry about rainouts. But the machinery had a problem from the start. Almost immediately after Safeco Field opened in 1999, the team discovered the immense weight of the roof was pushing the wheels sideways. Workers initially addressed the problem by attaching collars to hold the wheels in place, the Mariners say. That transferred the lateral load from the wheels to their bearings, grinding them down so much that some had to be replaced, the club says. Hired in 2004 to assess the machinery, New York-based consultant Tom Duffy advised the team to solve the load problem by adjusting the path for moving the roof, which stopped the structure from torquing. The change worked, he said, but another issue cropped up in 2012, when an axle broke during an All-Star FanFest event. 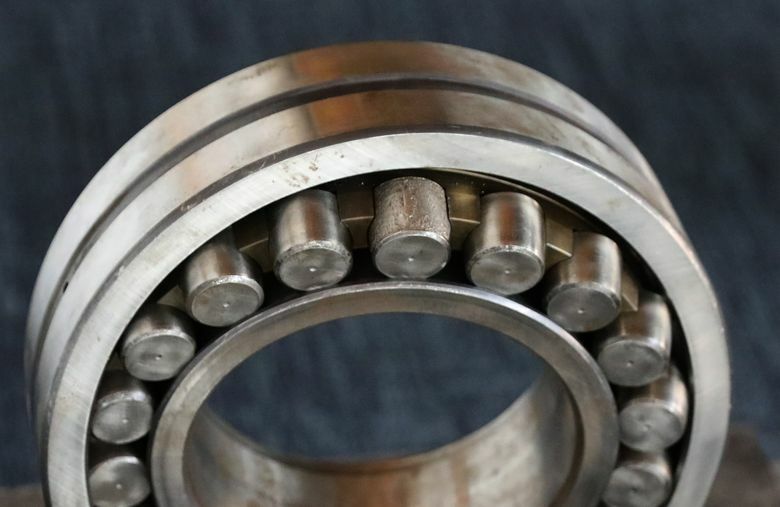 Grooves that had been machined into the axles to hold the collars in place had weakened the axles and made them susceptible to cracking, Duffy said. So the Mariners in 2013 began replacing the wheels and axles with more robust models — designating millions of dollars as unanticipated costs eligible to be paid for with admissions taxes by the Public Facilities District that oversees Safeco Field. Completing the project will cost about $6 million, and that work could be paid for with hotel-motel taxes, the team says, arguing the admissions taxes and other existing revenues are going to be inadequate to cover all the projects the ballpark needs. The Mariners are using the roof much more than they envisioned when Skogland was tapped to design the machinery all those years ago. “The original line of thinking was that the roof would be operated for in-season weather events,” he said. In reality, the club also uses the structure to shade the grass after applying fertilizer, keep dew off the seats and shield maintenance work. Every time the roof moves, the machinery undergoes some wear and tear, and Duffy monitors the axles for cracks. 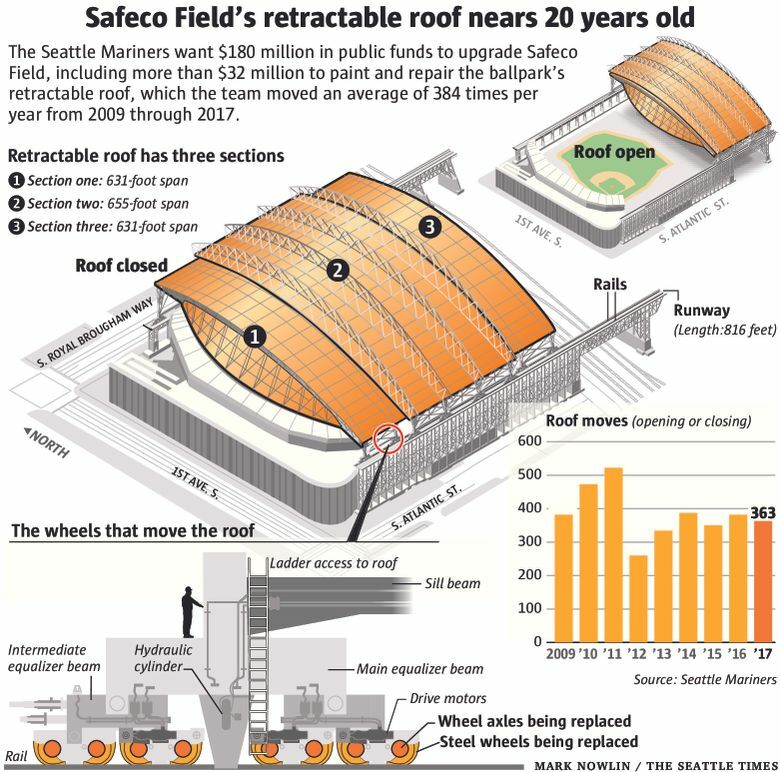 Neither Skogland nor Duffy believes the Mariners are overusing the roof by opening or closing the structure an average of 384 times per year since 2009. Skogland assured the team the canopy could be used for nongame purposes, and Duffy says the machinery would be holding up better had the axles not been grooved. In comparison, the Milwaukee Brewers move their roof more than 200 times per year, while the Houston Astros move theirs about 160 times per year. Using the roof for nongame purposes is worthwhile, the Mariners say. For instance, the team recently used the structure before a Pearl Jam concert to keep risers on the field from heating up in the sun and singeing the grass. The ballpark hosts about 40 non-Mariners events per season on the playing surface, Hale said. Besides the machinery, other aspects of the roof must be improved, according to the team. Nearly $8 million is needed to replace nine acres of plastic panels that make up the roof’s top membrane, while $15 million is needed to repaint and remove corrosion from the steel beams that support the structure. The Mariners recently replaced the roof’s computer controls but likely will need to modernize them again sometime in the next 25 years, Hale said. The team says the hotel-motel taxes would help pay for $385 million in capital improvements at Safeco Field as part of its broader renovation plan, which also includes maintenance work and amenity upgrades such as new brewpubs at the ballpark. The Mariners say the county should contribute the taxes because the public owns the ballpark, while opponents say the team can afford the projects.